Another source of funds for wildlife conservation in Maine is the Sportsman Plate. 15 percent develops boat launches for public access to Maine's inland waterways. The plate costs $20 annually, plus regular registration fees. Vanity plates with up to six characters are an additional charge. 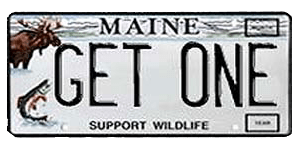 The Sportsman Plate is available at Bureau of Maine Vehicles or designated town offices.